KUALA LUMPUR: Tradewinds Corp Bhd (TCB) is scheduled to demolish two of its buildings here next year to make way for the Tradewinds Centre project. The Tradewinds Centre, which will have four towers and is stimated to have a gross development value of more than RM5 billion, will be built at the locations of the Crowne Plaza Mutiara Hotel and Kompleks Antarabangsa in Jalan Sultan Ismail. The project will sit on a 2.8ha land and consist of office units, serviced apartments and a retail component. According to sources, Crowne Plaza, which is managed by international hotel group Inter Continental Hotels Group (IHG), is expected to close its doors in March next year. It is unclear if IHG will be compensated should its management contract be terminated ahead of its tenure. Crowne Plaza could not be reached for an immediate response. Business Times had reported earlier last year that TCB was looking for a partner to help fund the project. Sources said a related company could buy one of the four towers for an estimated RM600 million. Attempts to contact TCB group chief executive officer Shaharul Farez Hassan failed. A search on the Internet reveals GDP Architect as the architect hand-ling the Tradewinds Centre project with the first phase of completion slated for 2016. "The Tradewinds Centre explicitly seeks to establish itself in the international arena of great financial developments. The Tradewinds project offers Kuala Lumpur many exciting features that will enhance and expand the city's growing modern qualities, similar to Rockefeller Center for New York, or Roppongi Hills, for Tokyo," said the architect firm's website, which also carries an artist's impression of the building. The total gross floor area is 3.17 million sq m and it will have 2,888 parking lots. 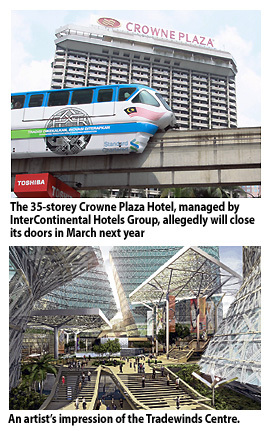 Interestingly, in September last year, the then Kuala Lumpur mayor Tan Sri Ahmad Fuad Ismail said it had granted TCB an order to redevelop the 21-year-old Hotel Istana, located at the corner of Jalan Raja Chulan and Jalan Sultan Ismail. TCB will hold its annual general meeting tomorrow.